The magnificent taste and aroma of each cigar is the result of a perfect marriage of the finest quality tobaccos grown from premium seeds in the lush of the San Andres Valley, in Veracruz, Mexico. Hand made by only our best cigar rollers for the most discriminating cigar aficionado. Aromas Gourmet: Each cigar is put in amber crystal tubes, enclosed in gold-foil cases and packed in a Spanish cedar box to mantain optimum freshness. 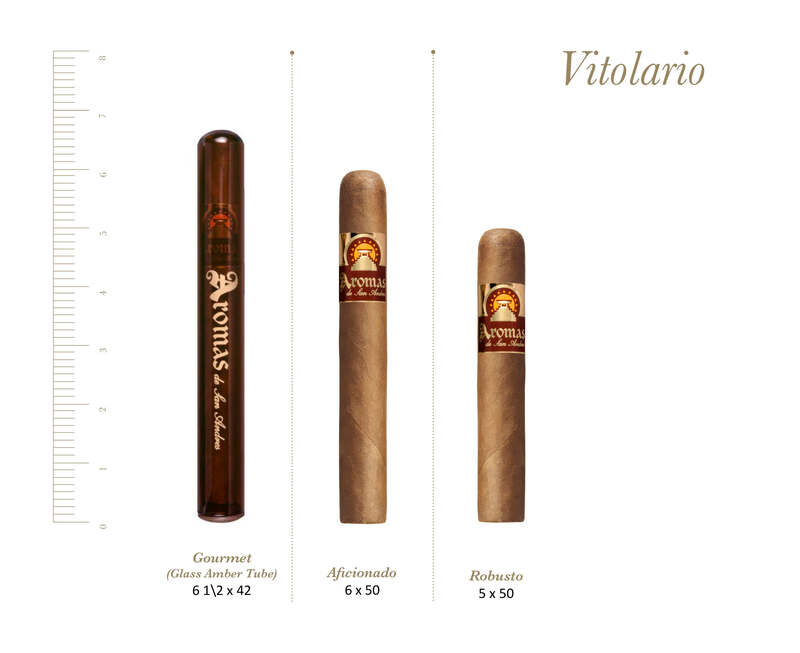 Aromas Imperial: Each cigar is packed in a golden aluminum tube to preserve the San Andres aroma. Filler: Blend of regular and Creole San Andres Long Filler Binder: San Andres Morron Obscuro Wrapper: Capa fina Clara of San Andres. Packaging: In natural cedar boxes | The Gourmet: Cigars are packed in amber glass tubes, and individually in cardboard boxes.